Auburn is a small town of 13,000 near over 20 recreational lakes. Three major rivers come together here: the American River, the Bear River, and the Yuba River. the gateway to the Sierra Nevada Gold Country. This is a region of tremendous History and Natural Beauty. Besides lakeside recreation, the area offers Championship Golf at 9 local golf links. Auburn is home of the Auburn State Recreation Area, which hosts more sporting endurance events than any other place in the world. The town enjoys the title of Endurance Capital of the World. Photo of old town courtesy of Wikipedia and Bobak. You can live in one of the town neighborhoods or an active community. Two of those include Alta Sierra and Lake of the Pines. Zillow.com records the median home value in early 2019 to be $461,600. Auburn is ideally located just 25 minutes from world class shopping at the Roseville Galleria. Just up I-80 we are one hour from Lake Tahoe. And an additional 30 minutes to Reno for shopping, gaming, dining and live entertainment. The unique History of the Gold Country has a whole life unto itself with a culture that supports a heritage of local lore and traditions. This is wine country so there are some excellent restaurants in the area. Crime in Auburn is just under the national average. Auburn is close to 4 major regional medical centers, Kaiser Roseville, Mercy San Juan, & San Juan Medical Center, and UC Davis Medical Center. All top rated and highly acclaimed cardiac & respiratory care facilities. Sutter Auburn Faith Hospital and further north Sierra Nevada Memorial Hospital are the local urgent care centers. Private Practice Physicians handle short term out patient care. 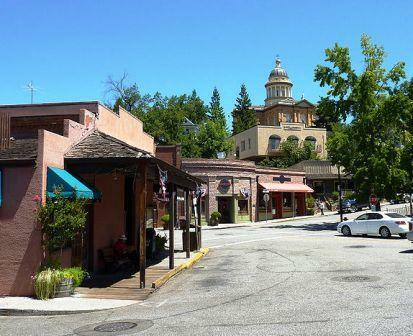 The Local City Shuttle Bus is a great way to get around in both Auburn & Grass Valley, with regular scheduled routes to the world class shopping at Roseville Galleria. The State Capital Mall has light rail service that will take you from down town Sacramento to the Folsom Outlet Stores for a full day of shopping! Our regional medical centers also offer shuttle service. Amtrak service.